5-Minute Dungeon is the co-operative, real-time card in which players have only five minutes to escape a randomised dungeon by defeating all of the monsters in the dungeon and then a more powerful dungeon boss at the very end. And by real-time, we mean that 5-Minute Dungeon is played against the clock with little or no time to plan from one encounter to the next, each player making best use of the cards in their hand, hoping that they will have enough cards to last each five-minute game. Then it will be on to the next five-minute dungeon, against a more powerful boss, or simply put away after five minutes of fun before a longer, deeper game. Published by Wiggles 3d, 5-Minute Dungeon is a five-minute blast of chaotic fun. 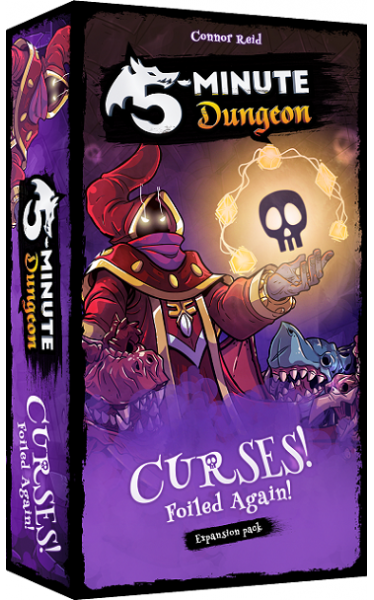 Now following a second successful Kickstarter campaign, the publisher has returned to 5-Five Minute Dungeon with its first expansion, 5-Minute Dungeon: Curses! Foiled Again! Expansion. This adds several new features to the game—Boss Cards, including Curses; two new Characters, the Druid and the Shaman; powerful Artifacts that give the adventurers an edge just when they need it; and the means to expand 5-Minute Dungeon from a two to five player game to a two to six player game. The most obvious addition to the game is that of the two new Characters, the Druid and the Shaman. In original game, the various Characters specialised in specific symbols, for example, the blue Scroll cards for the Wizard/Sorceress and the green Arrow cards for the Ranger/Huntress. Neither the Shaman or the Druid do this. Although the Shaman/Druid deck contains cards with all of the symbols, it really introduces cards which deal with particular situations. This includes ‘Infinity Cards’ of the various symbols which when played match the number of symbols of that type on a Door or Boss card. So for example, one of the Mini-Bosses in the expansion is ‘The Necro-Nom-Icon’, which requires five Scroll symbols to defeat. If the Shaman or Druid has an ‘Infinity Card’ with the Scroll symbols, then it will match those on the ‘The Necro-Nom-Icon’ card and so easily beat it. Thus the ‘Infinity Cards’ are really good for targeting Bosses and Mini-Bosses with lots of symbols of the one type. The new black-edged cards in the Shaman/Druid deck follow through on the positive, healing and nature-related abilities you would expect of either character type. So, ‘Tame Creature’ defeats a Monster; ‘Cleanse’ removes a Curse; and ‘Ancient Healing’ lets all players draw two cards from the top of their discard piles. All good cards and thematic without being complex. All characters gain access to another new card type—Artifacts. There are six of these in the expansion, each an attractive foil card and each of which can be wielded once per dungeon. Each is tied to a particular character, for example, the Battle Axe usually wielded by the Barbarian/Gladiator can be used to defeat a Monster or allow all players to draw two cards, whilst ‘Rainbow Herb’ of the Huntress/Ranger enables all players to add their discard pile to the bottom of their draw pile. This last card is very powerful, repowering everyone’s decks, but all of the Artifact cards are powerful. Now the obvious thing to do would be to add each of these artifacts to their respective character’s deck, but 5-Minute Dungeon: Curses! Foiled Again! Expansion does not do that. Instead, the only Artifacts that the players and their characters have access to are those belonging to those characters not in play. Thus if the Huntress/Ranger is the only character not in play, then the only Artifact that the players and their characters have access to is the ‘Rainbow Herb’. What this means is that characters not going on the adventure into the dungeons can still help out and the fewer players there are, the greater the number of Artifacts they have access to. Further, the abilities of the Artifacts may actually influence which characters the players decide—or decide not—to play. Now there is a good reason why the players and their characters require such powerful Artifacts and cards—Bosses get their own decks. Now these are mini-decks, just five cards set up as part of the usual process and containing Event Cards, Mini-Bosses, and a new card type—Curses! For example, ‘House Rules’ forces players to play with their cards away from them Hanabi-style and so has the other players choosing what cards a player can play, whilst ‘Cursed Blocks’ limits everyone’s hand of cards to just three. Curses are horrible because they stay in play and affect everyone until they can be got rid of, but at the same time some are very funny and silly and add further to the chaos of the game. Physically, 5-Minute Dungeon: Curses! Foiled Again! Expansion is very nicely produced. The cards are feel good in the hand, the artwork is really nice and fits the slightly tongue-in-cheek style of the game. The foil cards of the Artifacts are of course, eye-catching and attractive. 5-Minute Dungeon: Curses! Foiled Again! Expansion does not fundamentally change the play of 5-Minute Dungeon. Instead it adds more of the same, more silliness, more chaos, and of course, more players. It ups the difficulty too, but also gives the means to counter that difficulty, but that of course depends upon the right cards coming into play at the right time. If you enjoy 5-Minute Dungeon as a blast of silliness, then 5-Minute Dungeon: Curses! Foiled Again! Expansion infuses it with more challenges, more chaos, and more short, sharp fun.